EVC offers an exceptional range of specialized professional services—from survivability technologies, safety and occupational health, quality and environmental consulting, and production services—to logistics and program management support, education and training development, information technology services, strategic planning and process improvement, and healthcare management—to information research, special missions advisory and assistance, and more. EVC provides trusted, low-cost survivability technologies and signature management solutions—from the initial coatings formulation to specialized applications and process integration. 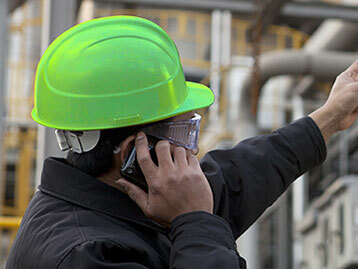 EVC offers a full-range of support to identify, assess, address, and measure risks to employees, users, and equipment. We help you maintain a safe and healthy workplace with a management system approach that’s built to last and respond to change. EVC brings a broad mix of safety and health professionals with science and engineering disciplines together to help your organization comply with safety laws and regulations, reduce workplace injury and illness, and improve safety of systems and products. EVC’s full-service Education and Training Development Team is known for creating innovative, cost-effective human performance solutions, marketing materials, and brand development products. We can help determine your organization’s human performance needs, from a single analysis to a full training program, providing tactical solutions and long-range strategies. At EVC, we are healthcare process experts. Whether those processes are clinical, operational, or strategic, we understand how to break them down to their base elements, identify bottlenecks and constraints, find opportunities for improved efficiency and innovation, and effectively implement change. EVC’s Healthcare Management Consulting Team has a strong record of working with providers to implement innovative ideas and improve operational and clinical processes. We are committed to our clients’ success, and will work with you to meet your program objectives and realize bottom line improvements. EVC’s experts provide in-depth modeling, analysis, and optimization of existing processes, improving efficiency and removing cost from your systems. We follow a proven method that includes first-hand observation of processes; in-depth analysis of inefficiencies, bottlenecks, and performance constraints; process redesign and implementation; sustainment, monitoring, and automation plans and tools; and change management methods. EVC’s Information Research Team can help government and business solve problems by supplying the information needed to make critical decisions in a timely and effective manner. Staffed by a blend of librarians, data conversion analysts, open source intelligence and all source intelligence analysts, our team conducts research in traditional and non-traditional resources to support decision makers and formats the data to meet your needs in either report or database formats. EVC offers cost-effective professional IT services for the public and private sectors. This includes custom software development, information assurance, and software maintenance and sustainment. We have developed and maintained production-level applications and systems heavily used and relied upon by operators throughout the world. EVC understands the importance of system reliability and security. We specialize in performing critical and essential information assurance tasks to ensure government and industry compliance is fully achieved. EVC provides support to manage worldwide logistics and systems programs for Government, helping clients develop, oversee, analyze, and improve their enterprise operations at a competitive cost. Across Logistics and Program Management Support, we analyze needs, highlight gaps, and support solutions for program and mission success. We work as teammates, with skilled, professional staff to bring you the right knowledge and experience in analytical, technical, and programmatic services. What makes EVC Production unique? It’s our ability to tap into the consulting expertise from all EVC divisions and leverage the engineering design and development capabilities of our partners and our parent company, Concurrent Technologies Corporation (CTC). Using our robust supply chain, we manufacture, assemble, and test to customer drawings and specifications, and afford our customers with remarkable value in meeting their production needs! The EVC QMS, as it relates to the design, manufacture, production, assembly and test of aerospace related products, is certified to AS9100D:2016. Our Quality and Environmental Team and Certified Quality Auditors can provide your organization with consulting support, including quality and environmental management/system development, auditing, configuration management, and supply chain management. We help you achieve your quality and environmental objectives, improve products and services, reduce rejection rates and rework, and enhance environmental performance. The EVC Special Missions Team provides solutions for the Special Operations Forces (SOF) community to globally address environments characterized by irregular warfare and threats. With decades of experience, our former SOF operators and strategists expertly translate client requirements to our engineers, technologists, and scientists. We not only modify/integrate existing commercial-off-the-shelf or Government technologies into user-level SOF solutions, we create new, mission-unique technologies. Our subject matter experts also provide program and project management, including developing and delivering instructor-led and distance training in a range of Special Missions areas. EVC offers a full range of strategic planning services, from retreat planning and facilitation to execution and follow-up. Our detailed analyses identify an organization’s internal strengths and weaknesses, as well as external opportunities and threats. We use that information to help our clients develop objectives and identify corresponding metrics to measure progress towards those goals. Our approach to strategic planning includes defining key criteria and mid- and long-term plans to meet the organization’s objectives; creating roadmaps to achieve milestones and measure results; and leading workshops on topics such as continuous process improvement and its impact on improving quality and reducing costs, the growth of BPM and its role in an organization, and how to achieve sustainable change. The end result is an actionable, customized plan which we help execute to success. This approach helps to link an organization’s strategic vision with the tactical execution needed to meet its long-term objectives.